Hard on the heels of the death of one princess, Glatt gathers info and gossip about the world’s other favorite princess, Grace Kelly of Monaco, and her three rebellious children, Prince Albert and Princesses Caroline and Stephanie. It’s difficult to judge the merits of an exposÇ such as this one without looking at it in the context of current times. True, the seemingly fairy tale fate of glamorous Hollywood movie star Grace Kelly becoming Princess Grace of Monaco in 1956 offers the perfect fodder for an escapist read, but one still has to question Glatt’s (Lost in Hollywood: The Fast Times and Short Life of River Phoenix, 1995, etc.) timing. Short paragraphs and out-of-place comments seem inserted after-the-fact to connect the Monaco royals to Diana and capitalize on the current hot topic of paparazzi invasion. 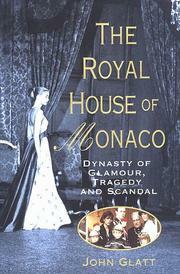 Whereas a biography of a deceased public figure doesn—t necessarily have to become tabloid material, Glatt focuses his on the remarkably irresponsible behavior and embarrassingly ill-informed choices made by Monaco’s ruling family after the death of Princess Grace. This direction taints Glatt’s intentions (whatever they may really be) with a gossipy cast. The author did obtain the cooperation of Prince Albert and others close to the family, but that doesn—t necessarily transform his book from a gratuitous ogling into an enlightening explanation of their tragic misfortune. As for the writing, Glatt repeats himself: several anecdotes and quotes show up again and again in only slightly different form. However, for what it’s worth, Glatt understands how to string together a ton of minute, only momentarily intriguing details into an action-packed, larger-than-life TV movie of the week. For those interested in glimpsing how royalty live, this is probably, and perhaps regrettably, a winner.